Le hall de loisirs de l`École de Langue russe est l`endroit pour se détendre entre les classes et en parlant russe, buvant du thé ou du café dans une atmosphère sympathique et confortable avec les étudiants du monde entier. Le programme social hebdomadaire offert pour les étudiants de la langue russe à l`Institut Derzhavin, a quelque chose pour tous les étudiants de tous les âges. Le premier jour de classes, les étudiants reçoivent un classeur informationnel incluant une liste d`activités sociales pour la prochaine semaine avec les dates et les prix, s`il en est tels. Ces activités sociales incluent des visites aux musées, les tours dans et autour de Saint-Pétersbourg, partis, promenades et voyages de théâtre. En prenant les étudiants de la classe, ces activités leur permettent de pratiquer la langue russe dans les paramètres sociaux et les situations de vie réelles et gagner une compréhension détaillée de langue russe par les traditions culturelles. Sur cette page, il y a une vue d`ensemble brève des sites les plus attrayants dans et de l`encerclement St.-Petersburg pour tous ceux qui projettent d`étudier la langue russe à Saint-Pétersbourg ou juste arriver ici comme un touriste (voir la liste à gauche). 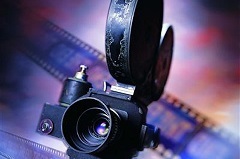 Certaines des activités régulières telles que la Leçon de Chanson russe, la Leçon D`art Folklorique russe et les projections de Film russes sont offertes gratuitement. Tous les samedis nos étudiants jouent le football. Nous organisons des jeux de pratique et des matches avec les équipes des autres universités russes. Rejoignez notre équipe Derzhavin internationale ! En outre, il y a toujours quelque chose à voir à Saint-Pétersbourg et nous essayons de garder les étudiants à l`Institut Derzhavin informés de tous les événements à Saint-Pétersbourg donc ils peuvent les apprécier. Si vous voudriez rejoindre notre programme, envoyez-nous e-mail s`il vous plaît. We invite you to our Orientation Walk that is held every Monday.During this tour our guide will show you the banks, supermarkets, shops and cafes. We will help you to buy the metro card or metro coins and Russian SIM cards in case of necessity. We meet in the hall to speak Russian and discuss the topic “Travelling”. Come to learn famous Russian travelers and enrich your vocabulary. Cookies and tea are guaranteed. 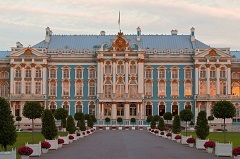 The Hermitage is the biggest museum in St. Petersburg and in Russia. 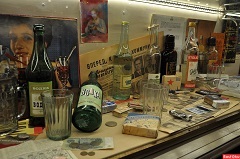 The collection contains more than 3 million exhibits. During this tour you will see the works of such famous artists as Leonardo Da Vinci, Raphael, Rembrandt, etc. and you will have a chance to enjoy the splendor of the state rooms of the former residence of Russian emperors and empresses - the Winter palace. 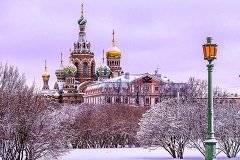 The Church of the Savior on Spilled Blood is one of the main sights of Saint Petersburg. This church was built on he site where Emperor Alexander II was fatally wounded by terrorists in March 1881. Now this cathedral is one of brightest examples of the mosaic art in the world. We will learn some facts about history of the Russian vodka and will taste 3 kinds of Russian vodka and 3 kinds of Russian snacks. Catherine’s palace and park in the Tsar’s village present one of the great examples of world-ranking architecture and garden-and-park design. A whole constellation of outstanding architects, sculptors and painters worked there to create this architectural masterpiece. During the tour we will visit the legendary Amber room to admire the beauty of the sunny Amber stone and learn about mysterious facts connected with the history of this famous room. We invite you to our Orientation Walk that is held every Monday. During this tour our guide will show you the banks, supermarkets, shops and cafes. We will help you to buy the metro card or metro coins and Russian SIM cards in case of necessity. During the excursion we learn about the history of the General Staff building and see the works of Monet, Renoir, Van Gogh, Matisse. 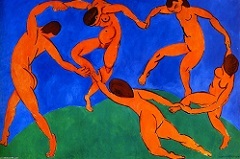 We will have a possibility to have a look at the pictures of the famous Russian artist Kandinsky. We are going to talk not only about new trends in art, that appeared in 19th-20th centuries, but also about personal life of artists and their connection with Russia state. 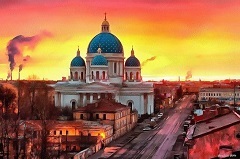 Lection on Russian culture "April 12-Сosmonautics Day"
The Cathedral was constructed by the French architect Auguste Montferrand. The construction works lasted 40 years (1818-1858). During the tour we will admire the beautiful interiors of the church and learn more about the architectural particularities of this colossal building. 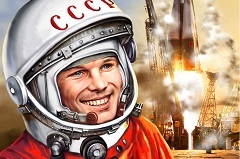 We learn new facts about the most famous Russian cosmonauts and Russia's role in space development. 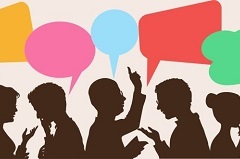 Would you like to learn new Russian words on space and science? Join us! During our trip to Pavlovsk we will see the palace of the most mysterious Russian emperor – Paul I. It was built by Charles Cameron between 1782 and 1786. Being an admirer of the classical style, Cameron gave to the building features of classical austerity and elegance. Comparatively small, the Great Palace strikes with its perfect harmony, proportionality and coziness. 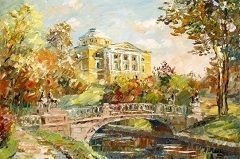 The Park is also unique: it is the largest landscape park in Europe. We read the articles from the Russian newspapers and discuss them. Come to enrich your vocabulary and train reading skills! 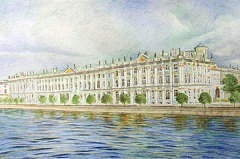 This museum is one of the biggest in St. Petersburg and in Russia. The collection consists of more than 3 million exhibits. In this tour you will see the works of such famous artists as Leonardo Da Vinci, Raphael, Rembrandt, etc. The tour will take us 2 hours and we hope that you will enjoy it. Do you want to take part in the traditional Russian games and to sing traditional Russian songs together with the artists and signers of the Folk band? Join our interactive folklore show! We will visit the legendary cruiser. It participated in the Russian-Japanese War. 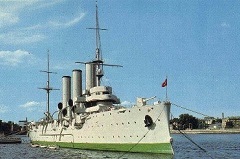 In 1917 the Aurora's crew took an active part in the April and October revolutionary activities. And we will see the gun that gave a signal for the storming of the Winter palace. Veliky Novgorod also known as Novgorod the Great , is one of the most important historic cities in Russia. 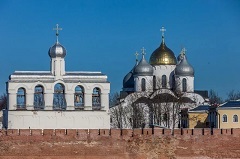 During the tour we are going to see the Novgorod Kremlin and the Cathedral of St. Sophia, a symbol of the city and the main cathedral of the Novgorod Republic. It is one of well-preserved churches from the 11th century. We will also see the bronze monument to the Millennium of Russia and visit the territory of the Yaroslav's Court. After the lunch we will visit the museum of wooden architecture, where we will see traditional Russian wooden houses known as izba and ancient Russian wooden churches. We invite you to our Orientation Walk that is held every Monday. During this tour our guide will show you the banks, supermarkets, shops and cafes. We will help you to buy the metro card or metro coins and Russian SIM cards in case of necessity. 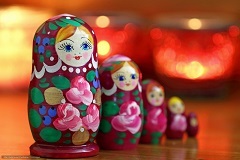 During this lesson we will paint Russian wooden boards, spoons and matryoshka dolls, listen to some Russian national songs and of course the lesson will be held in Russian, so you will have a chance to improve your language skills and create a souvenir with your own hands. 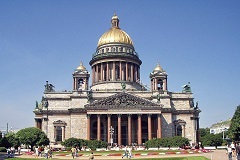 We are going to visit the main Orthodox cathedral of the city. We will learn a bit more about orthodox traditions and main features of the Russian churches, follow the story pf construction of this beautiful cathedral and see the only miraculous icon in the city. The Fortress was founded by the Russian emperor Peter the Great in 1703. 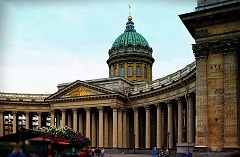 During the tour we will walk around the territory of the fortress and we will also visit the Peter & Paul Cathedral, that is a burial place for the Russian tsars, and see casemates of the former political prison. 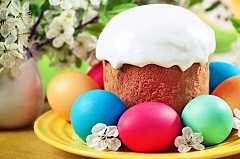 We will paint Easter eggs, eat Easter cakes and talk about Russian Easter traditions. Peterhof is one of the most beautiful residences of Russian emperors. 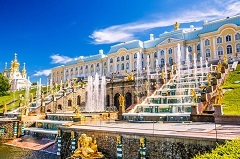 After 200 years of serving as a summer residence, Peterhof is inextricably connected with the Russian history. The seaside paradise was built as a grandiose triumphal memorial glorifying the grandeur of Russia, in conquering the much needed and desired access to the Baltic Sea during the Northern War. Don’t lose the chance to have a look at the palace and the fountains at the same time! It is the first day when fountains are opened in this year.